Quigley: I don’t think you choose. It’s from birth. You’re gay, and it’s the rest of your life. Colbert: Gay babies? I find that offensive, the idea that there are gay babies out there and they’re looking at me, and they’re sexually interested in me, as a man. Quigley: You have a point. It’s not a good point, but it’s a point. However, Quigley, a blue-collar dude, built like a fireplug, is something of a rock star when it comes to bringing home transportation funding to the Chicago region. He’s the only Illinois member on the House Appropriations Committee and its subcommittee on Transportation, Housing, and Urban Development, with the memorable acronym THUD. He helped secure funding for the federal Core Capacity transit grant program, which will help bankroll the CTA’s rehab of the North Red and Purple Lines, and the TIGER program, which funds various sustainable transportation projects in cities. 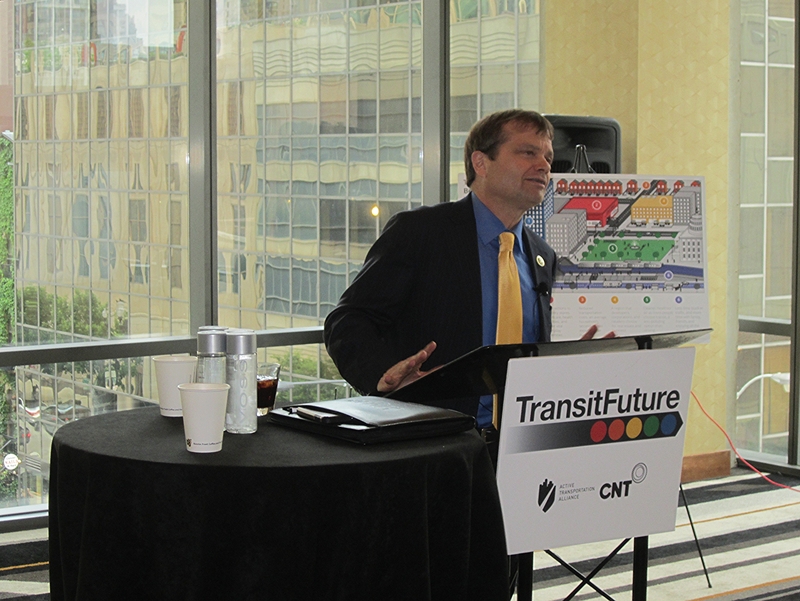 Quigley recently kicked off a lecture series to promote Transit Future, a campaign by the Center for Neighborhood Technology and the Active Transportation Alliance to create a dedicated revenue stream at the Cook County level for public transportation. Transit Future was inspired by a successful campaign in Los Angeles, where voters approved a half-cent sales tax to raise money for several new subway lines. If we don’t do something similar in Chicago, we may get left in the dust by historically car-centric L.A.
Several, but not all, Cook County commissioners are on board with the proposal to improve and expand local transit via a hike in the sales or gas taxes, real estate value capture, or other funding strategies. Last month, City Council unanimously passed a resolution in support of Transit Future—not a shocker, since the campaign would use county money to pay for Chicago public transportation. This local cash would be used to leverage federal grants that could fund some $20 billion in proposed region transit projects, including infrastructure repairs and new train routes to exotic destinations like Old Orchard, Schaumburg, Oak Brook and Ford City. That’s where Quigley comes in. If county money become available for matching funds, the congressman’s help will be crucial for bringing home the bacon from Washington. Speaking before a wall-to-wall audience of transportation wonks at the sleek Dana Hotel in River North, Quigley quipped that his career in public service is best described by the famous quote used as a John Lennon lyric, “Life is what happens to you when you’re busy making other plans.” An environmentalist in high school, he went on to study public policy at the University of Chicago and work as an aide to old-school Lakeview alderman Bernie Hansen. He planned to take over Hansen’s job, but instead became a county commissioner, and eventually won the 5th Congressional District seat after Rahm Emanuel left to serve as Barack Obama’s chief of staff. “How do you find your niche, what matters to you and how to get to that point?” Quigley asked. “Folks, I have found it and it is funding transportation for all of you. I’m bringing dollars back, big time.” There was thunderous applause from the crowd. Quigley acknowledged that the federal transportation funding picture is pretty bleak right now, with both the House and the Senate controlled by Republican deficit hawks, most of whom take a dim view of non-car modes. It’s telling that the current long-term transportation bill in the Senate is called the DRIVE Act (Developing a Reliable and Innovative Vision for the Economy). “We are about $3 trillion down on infrastructure in the country,” he noted. “We used to dream big and it drove the economy. Now we’re still using infrastructure we built during the Great Depression.” He lamented that Europe is currently investing twice as much on transportation as the U.S. is, while China is spending four times as much.